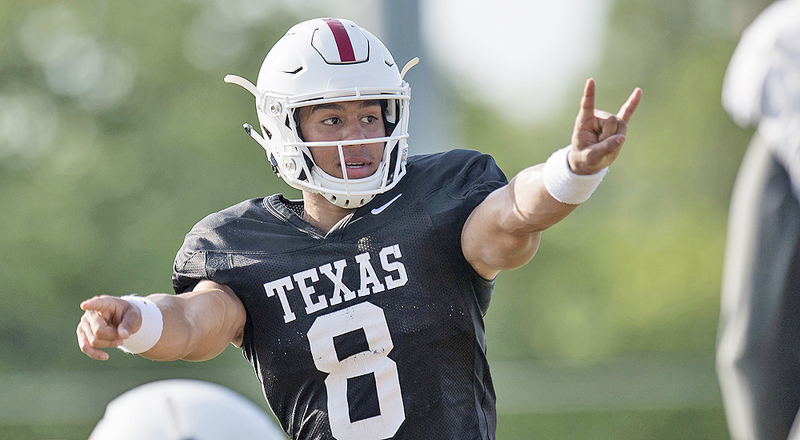 Redshirt freshman Casey Thompson made a strong case for the backup quarterback role behind starter Sam Ehlinger in Saturday's Orange-White scrimmage, rushing 11 times for 47 yards (photo courtesy of texassports.com). AUSTIN, Texas — The annual Orange-White Game that ends the Texas football team’s spring drills each year is, by necessity, pretty much plain Jane, kind of like vanilla ice cream without any toppings. The contest is used to cap the Longhorns’ 15 days of practice that began in March and is the only chance for fans and media to actually see the progression of the team for the first time in “game” action. It also is a time for the players to make a final impression or two on the coaching staff in advance of offseason drills, fall practice and the regular season, the latter still five-and-a-half months away. But we all can glean a little from the White team’s 12-6 victory Saturday over the Orange, mostly that this group of Longhorns is more athletic and confident than the team was at the same time last year. This Texas team will have plenty of playmakers available for employment by coach Tom Herman, even more — a lot more, actually — than were on display in the glorified scrimmage. One more thing: don’t mess with Mother Nature. The game was played in a cold gale, with the gusting winds affecting any chance of plays in the deep passing game and even influencing short tosses from the quarterbacks. For those who like defense, and sitting out in the cold and blustery conditions, this was your kind of game. The Orange team started the game with a 3-2 lead after results from the pregame circle drill, which judges players' toughness and leverage in one-on-one situations. White team linebacker Jeffrey McCulloch stepped in front of a Sam Ehlinger pass intended for Keontay Ingram and returned the interception 31 yards to the Orange team’s 1-yard-line. Backup quarterback Casey Thompson then picked up a poor shotgun snap on fourth down and freelanced his way to a 1-yard touchdown run that gave the White team a 9-3 lead. Kicker Cameron Dicker hit a 36-yard field goal with 8:47 left in the second quarter after a 13-play, 42-yard drive to boost the White’s advantage to 12-3. Dicker, who kicked for both teams, line-drived a 52-yard, wind-aided field goal with 1:30 to play in the second quarter to bring the Orange team to within 12-6 at intermission. He then missed a 60-yard attempt on the final play of the half. That was it for scoring, even though Ehlinger played most of the third quarter and Thomson was behind center until the fourth. “We will have a lot of good film to grade guys individually and it was good to see the defense step up a little bit after taking a few of these (scrimmages) on the chin this spring,” Herman said. “It’s good to see the defense take a little confidence into the summer and moving forward. 1. Thompson will be fine as Texas backup quarterback. This is Ehlinger’s team — about that there is no doubt. A year ago, Herman and his staff still were deciding if Ehlinger or Shane Buechele would be the starter, a job Ehlinger won by the season opener. He then started all 14 of the Longhorns’ games, accounting for 41 touchdowns, 79 percent of the team’s total. Ehlinger rushed for 16 of those touchdwowns, the most ever by a UT quarterback. But the lack of a proven backup, the role Buechele filled with grit and class last over the past two campaigns, and Ehlinger’s history of getting dinged up may force the Longhorns’ to put a governor on some of Texas’ inside running plays. Thompson is ahead of where Herman said he expected the redshirt freshman to be at this point, and his ability to make plays with his feet and overall athleticism netted the White offense 121 total yards, 47 of which came on 11 runs by the quarterback. Thompson also uncorked an interception as he was hit while passing and threw a wounded duck that was intercepted by cornerback Kobe Boyce in the first quarter. True freshman Roschon Johnson entered the game at quarterback two minutes into the fourth quarter and showed what coaches have said about him this spring: that he’s über-talented but a little overwhelmed at the speed of the college game right now. 2. The Texas defense finally showed up. We’ve heard a lot this spring about how the Longhorns’ offense has dominated the team’s scrimmages and how Texas needed to find some leaders on defense after losing eight starters from last year’s team. Well, call that mission accomplished, at least for one evening. The defense played the spring game without two of its best players because of injuries, senior safety Brandon Jones (ankle) and sophomore safety Caden Sterns (knee), last year’s Big 12 Defensive Newcomer of the Year (who have ankle and knee injuries, respectively). Also sitting out were one of the presumptive starters at cornerback in Anthony Cook (hamstring) and another at nickel back in Josh Thompson (head). The game was a dominating performance by the White defense, especially the first team, which limited the Orange team (the starting offense, with Ehlinger at quarterback) to 163 yards, 45 of which came on two passes and runs after contact from Ehlinger to Malcolm Epps and Devin Duvernay. Texas defensive coordinator Todd Orlando had to be pleased with his units, which obviously took a step forward from the earlier scrimmages. 3. Texas was able to run the ball, even when the defense knew it was coming. With the wind the way it was, there was little to no chance to throw the ball down the field, so the defenses for both teams stacked the line and attacked with little fear of being burned. Freshman running back Jordan Whittington, who has a chance to earn plenty of playing time in the fall, still found a way to rack up 62 yards on 12 carries for the Orange, with a long run of 19 yards. Also in the mix at running back are Ingram, who has gained 10 pounds of muscle over the offseason, senior Kirk Johnson and short-yardage back Daniel Young, giving the Longhorns the potential to shorten games, take the pressure off Ehlinger and play like they did against Georgia in their Sugar Bowl win. 4. The second-string offensive line is a work in progress. The Longhorns were lucky to get through most of last season without injuries on the offensive line, and Herman has talked plenty this spring about the need to build some depth in the trenches. Saturday’s game showed that the Longhorns' reserve linemen still have a ways to go, but they are a very talented and athletic group.